A number of studies conducted in the early 2000s highlighted the strong correlation between employee satisfaction and company performance. But what is the causal link? Are employees more satisfied because the company has more resources to meet their expectations? Or do they do better because they are motivated? Two recent studies have determined that satisfaction is the principal driver of performance, and not the reverse. Company leaders and managers thus have good reason to reinforce employee satisfaction. This leads to the question of what to do to make people happier. Some companies are known to make sizable investments in the wellbeing of their staff, by making the workplace environment more comfortable, introducing flexible working hours and personal services that make employees’ lives easier, etc. Others have been noteworthy for more surprising initiatives, such as providing self-service ping-pong tables and video games, an upscale cafeteria free of charge and open at all hours, etc. Even so, some companies offer comfortable working conditions but a terrible professional ambiance! -Focus primarily on helping people succeed! Employees tend to be most committed when they feel that they are able to move efficiently toward realizing their objectives. -Above all, do no harm. Avoiding blunders that sap motivation often has more impact than actively creating incentives! -Foster a mutually supportive culture. People feel stimulated when they are supported by those around them. -Recognize the importance of local management. How employees feel at work is greatly influenced by their immediate superior. What does influence employee motivation at work? What is the causal link between job satisfaction and company performance? The results of a survey on the role and performance of front-line managers. 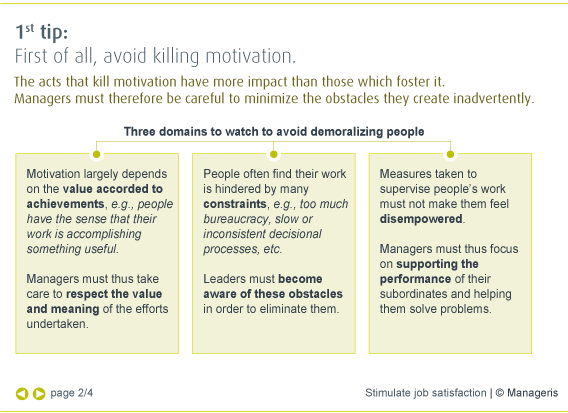 Four big mistakes to be avoided by leaders who don’t want to inadvertently kill the motivation of their subordinates. Findings of studies on what motivates people at work. 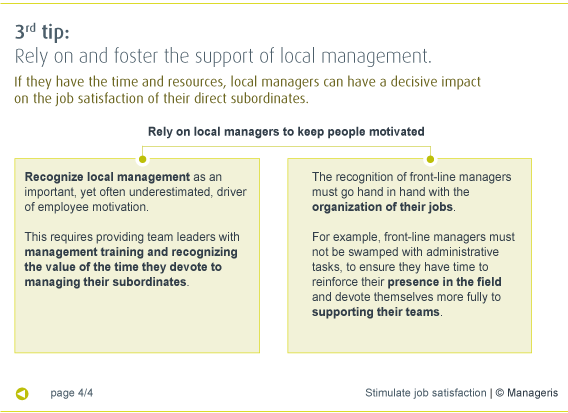 Ideas on how to reinforce the performance of front-line managers.